Today we got a popup message from AVG which is installed on a computer. 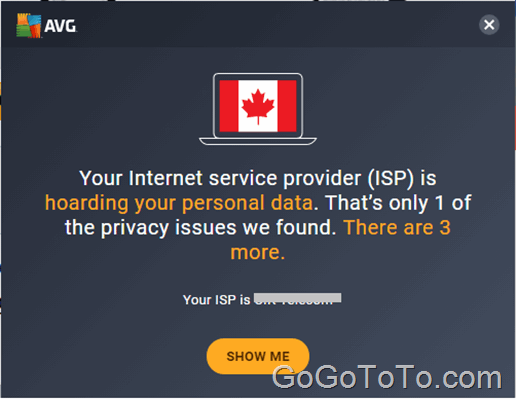 It indicates “Your Internet service provide (ISP) is hoarding your personal data.” This is a privacy issue. We have not done further investigation on that, so we will have updating on this blog later. Is it a common privacy issue such as web browser history cache ? or is it a really problem from our ISP ? Our ISP is Canada Rogers’ Distributor: CIK. But we initially think it is a common warning based on our local computer settings, such as there is no enough protection for our web browser history data, our private photos and files, our laptop webcam etc. AVG showed us the information might be a commercial advertisement. For example, they want users to upgrade existing AVG version to a pro which is a paid version. But, AVG could really give you a better protection if you use higher version.